Since windstorm Andrea denied me my chance of having a nice warm glasshouse walk in the Edinburgh Botanic gardens (see here for the gory details), I took advantage of a couple of days in London to bask in the warmth of the tropical houses at the Royal Botanic Gardens in Kew. I note in passing that to get into Kew costs almost £14. In Scotland, where we retain some vestige of the belief that education (even about plants) is a public good, entry to our Botanic gardens is free to all. This is a point to which I shall return later. This year’s festival is inspired by the ‘forces of nature’ – fire, air, water and earth. See the lush tropical landscape of the glasshouse contrasted with vibrant floral displays – fiery reds, yellows and oranges, and shimmering silvers and blues. In other words, it was about orchestrated colourful hanging baskets: Very pretty; very impressive……and maybe not averse to a bit of fakery. 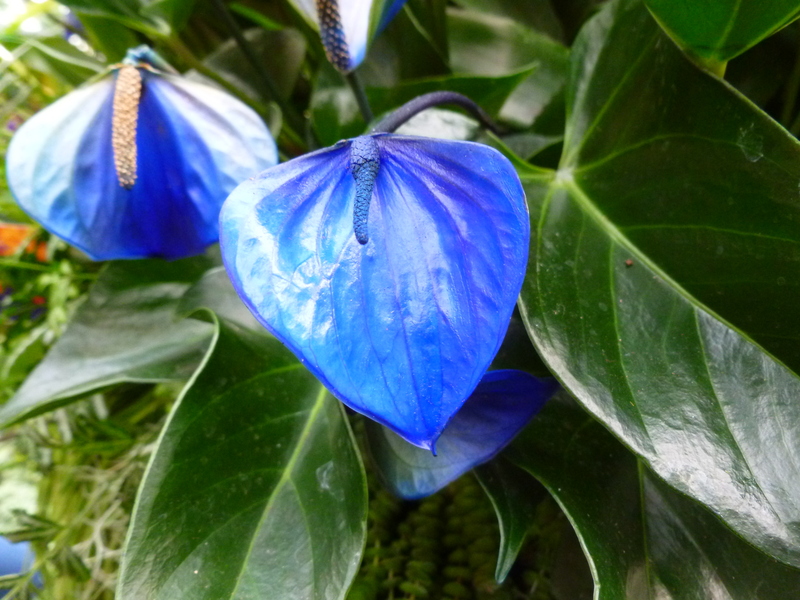 Is this lovely blue (water-themed) anthurium really natural, or has it overdosed on dye? I’m no doubt being curmudgeonly (again) in stating that I don’t think it’s the business of a botanic garden and respected research institution to put on a dumbed-down display of themed flower arrangements, complete with models of fishing villages (water) and seed sculptures (air). But what would I know? I’m just a gardener. I would feel better about it if I didn’t think it had more to do with extracting that £14 entry fee from as many people as possible than with introducing them to the world of plants. 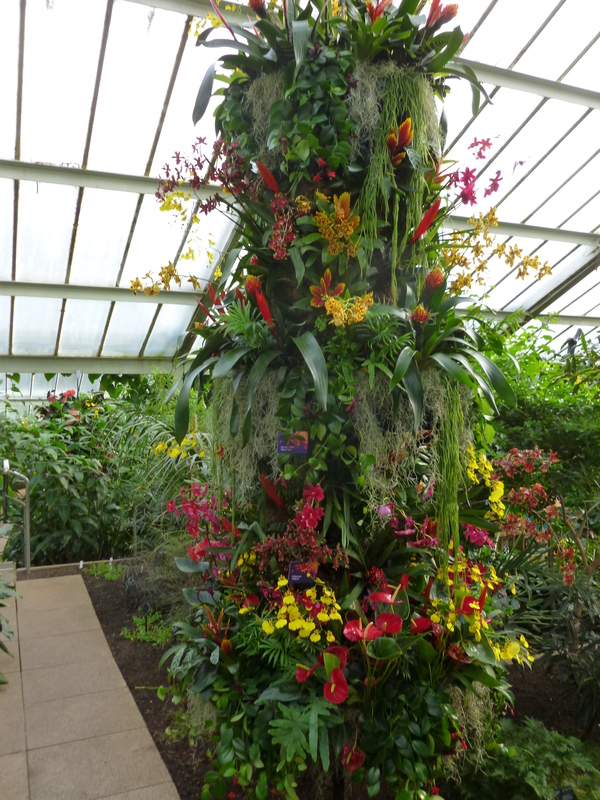 This entry was posted in Gardening in Scotland, public gardens and tagged kew, orchid displays, tropical glasshouse by kininvie. Bookmark the permalink. “Not happy at Kew” was a good title. If that column in the 4th image didn’t strike me as ghastly then I might not agree with you. And truly expensive. Still, the first image is quite nice. Yes, the orchids on their own were nice. But if I had wanted to look at flower arrangements, I would have gone elsewhere. No wonder you feel short changed, I think I would too. The Anthurium looks positively radio active, never seen one that colour before, surely it has to be dyed ! 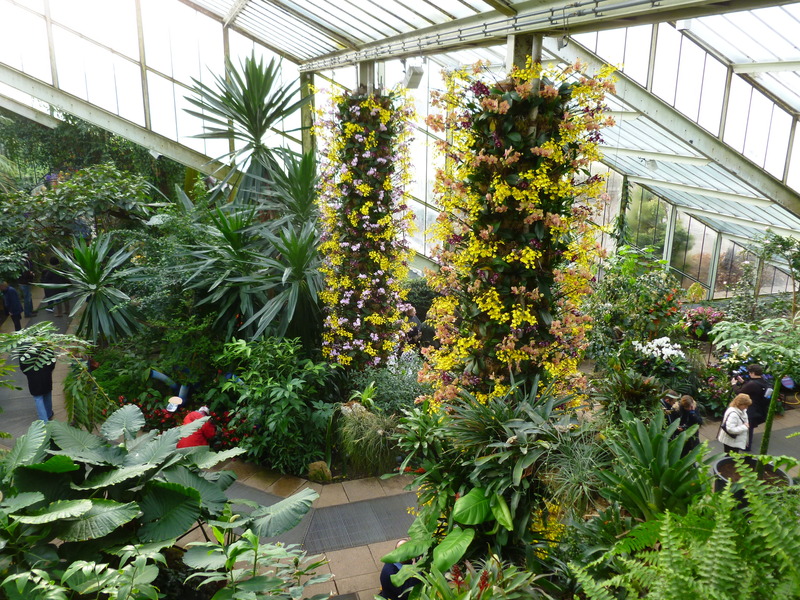 I’ve visited Kew Gardens only once, it was end of summer and I have been so impressed by the beauty of that place. The Nosegay Garden, a long allée with hydrangea serrata ( or was it villosa? ), I loved the beddings, the pools, the big trees (especially a big eucalyptus with white bark). That particular time I would have paid even more than 14 pounds with no regrets. I’ve been wanting to go to Kew for a while now but the price has been putting me off. I think in winter there should certainly be a reduced a price to get in. It seems crazy to get people to pay the say amount even though there is a lot less going on in winter. I was just talking to my husband about admission prices the other day. I used to work in the museums sector so I know how expensive it is to run these sorts of places and many of the staff despite lots of qualifications, skills and knowledge still don’t get paid very well. It’s strange though that we will pay £20 or more for theatre tickets for only an hour and a half of entertainment but baulk at £14 for a whole day. I can understand why you didn’t think it was value for money if there was so little to see, should be half price in winter, maybe. Those blue flowers really are awful. I agree that a lot of botanical gardens need to work harder on their educational element. That’s why I like the Eden Project so much. There is are good amount of text panels and info without it being too much. The National Botanic Gardens of Wales are very good too. Might wait till the summer until I visit Kew. Thanks for the review. I’d not be happy at Kew either, although I have a slightly biased view of that ‘other UK botanic garden’, RBGE was started a year earlier don’t you know AND as you rightly say doesn’t charge entrance to the garden (although they do for the larger glass houses), nor is it ever likely too. Not that I’ve been brainwashed,no no, but we don’t tend to talk about that ‘other garden’ much for fear of being smited and struck down with lightening. When I visited Kew a while back, I wore a disguise. 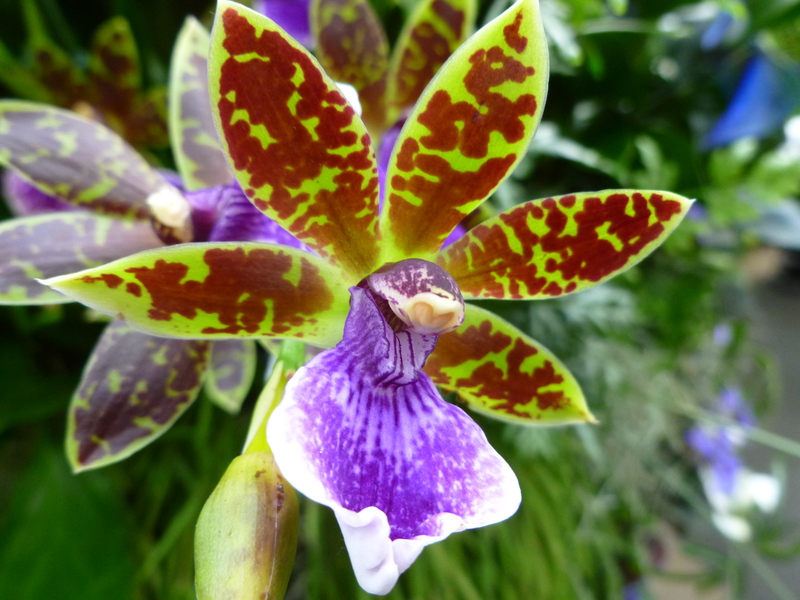 The mission of ‘explaining and exploring the world of plants’ to anyone who’ll take the time to listen, shouldn’t be dulled down with an entrance fee or parading plants in displays like those poor orchids, like, well I won’t say the word, its early. That forth picture looks like Carman mirandas head gear. Hurricane Andrea has a lot to answer for. I see what you mean, although you did get some good pictures. However I have decided, I am going to save up twenty eight pounds and pay a visit in the Summer. Summer would be a lot better. I think they should give a winter discount. There’s a terrific shop, BTW, so I would take more than twenty eight pounds, if you can. OK, I may take an extra tenner. Summer would be good, and worth the money. Well at least the Greenhouses in Edinburgh are open again, having just paid a visit. We thought they were expensive as it used to be free in the dim and distant past when I was but a bairn. Walking round was curtailed by numerous pot plants being moved about and two of the greenhouses including my favourite Peat greenhouse needing a rebuild but it was still pretty good. Two moans where have the giant lily pads gone? and it was half term… enough said! What? No lily pads? I’ll never grace the place with my presence again! Are they really hanging baskets!!? Depends how you define basket. Pillars with earth-filled slots might be more accurate. But that counts as hanging basket in my world. I was struck by the blue anthurium. 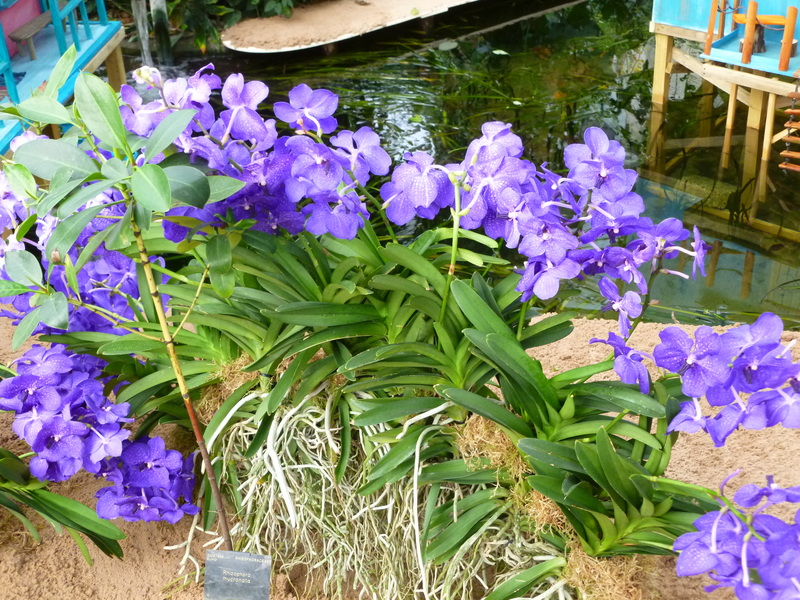 It must be the color of choice — I posted a photo of an orchid also dyed blue. Why mess with nature?? I can’t imagine. Because you can, perhaps?